Fighting terror on a motorcycle!! Look. I'm a fan of these movies. The Spiderman movies are great. This one? Hm. The plot is...interesting? Steve Rodgers (in this incarnation appearing to be a homeless traveler, having left the army. 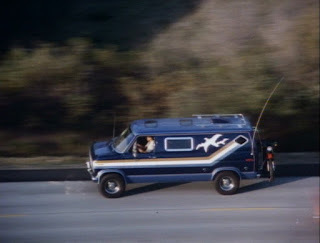 Think Rambo with a sweet van, and without the angst) is driving to his friends to pick up his mail. Yes. That's the first ten minutes of this movie. Then people try to kill him. For reasons. 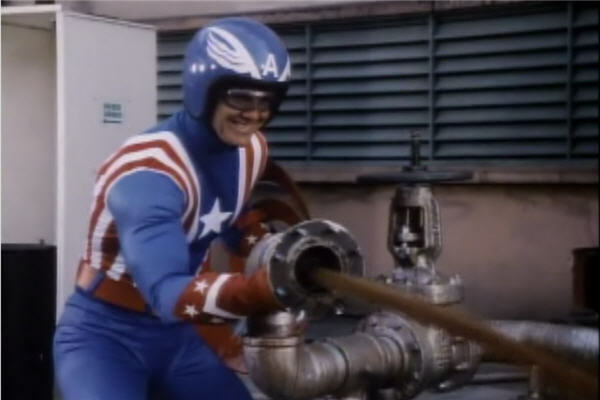 It seems to happen because his late father was a serumed-up super soldier, nick-named Captain America. The Government asks Steve to help with continuing his father's work. He refuses. Then Steve's father's bestie get murdered by the people looking to get hold of "something to do with a neutron bomb". And push him and his bike down a small hill! And he nearly dies! 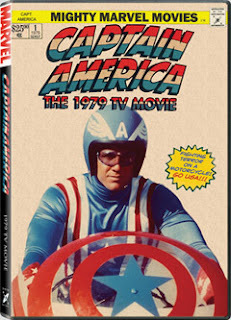 So they turn him into Captain America anyway! Super soldier! Then he stops "something to do with a neutron bomb". This is low-budget schlock, but that's what it's supposed to be. So what's the problem, if anything? There's only one thing wrong with this movie. It's not the story. Captain America: Origin Story. It's not the acting. Reb Brown (Steve Rodgers) was born for this sort of B-Movie trash. It's got Lance LeGault as the "heavy" bad guy. Colonel Decker from The A-Team TV show. Running in at 120 minutes (the same length as Captain America The First Avenger), it's well over an hour before you get any "Cap". He's only in two fight scenes. The movie consists of protracted helicopter shots of cars driving, and motorcycles traversing terrain. The beach shots. Jeez. The beach scenes. The film is actually jolly fun when something is happening. Which sadly isn't very often. He trashed his bike like three times. He punches bad guys. Deflects bullets with his shield. He saves the world from a neutron bomb! But it only lasts about fifteen minutes. And the rest is Reb's chest.